In an election month, young people across America learned a lot about making choices, and today they get the chance to make the choice to not use tobacco. Today, November 15, 2012, marks the 37th Great American Smokeout, a day promoted by the American Cancer Society every third Thursday of November to encourage smokers to make a plan to quit smoking, or finally quit smoking altogether on that day. Research shows that quitting — even for one day — smokers will be taking an important step towards a healthier life – one that can lead to reducing cancer risk. 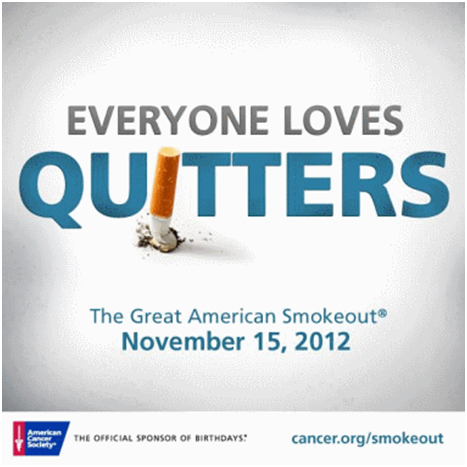 Image: Campaign banner for the Great American Smokeout 2012 by the American Cancer Society. 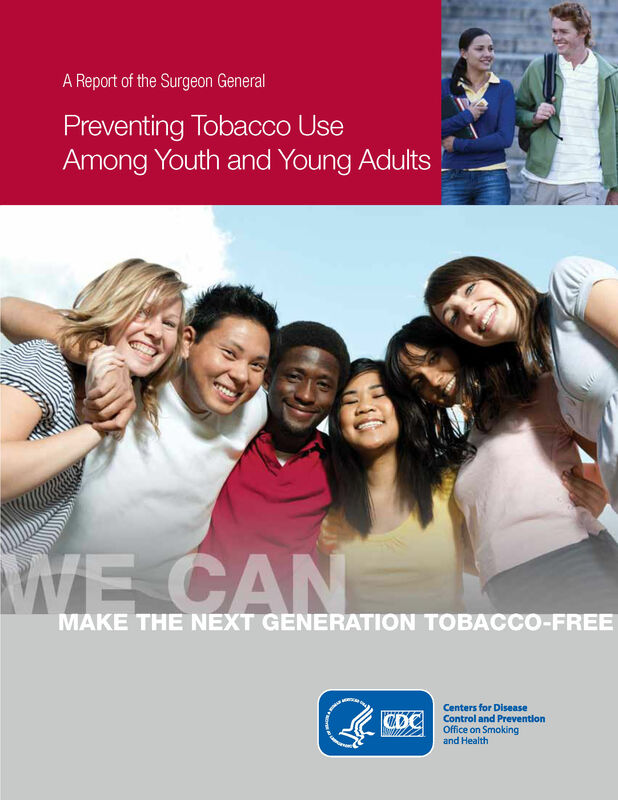 3) A booklet of “Preventing Tobacco Use Among Youth and Young Adults: We Can Make the Next Generation Tobacco Free”. This easy-to-read booklet aimed to parents, schools and community public health practitioners contains highlights from the 2012 Surgeon General’s report on tobacco use among youth and teens ages 12 through 17 and young adults ages 18 through 25. The first four pages are an overview of youth and young adult tobacco use, and the sections that follow provide details on health effects, factors that encourage young people to use tobacco, the role of the tobacco industry, and what we can do to solve the problem. This chapter gives an overview and summary of the report’s findings and conclusions. 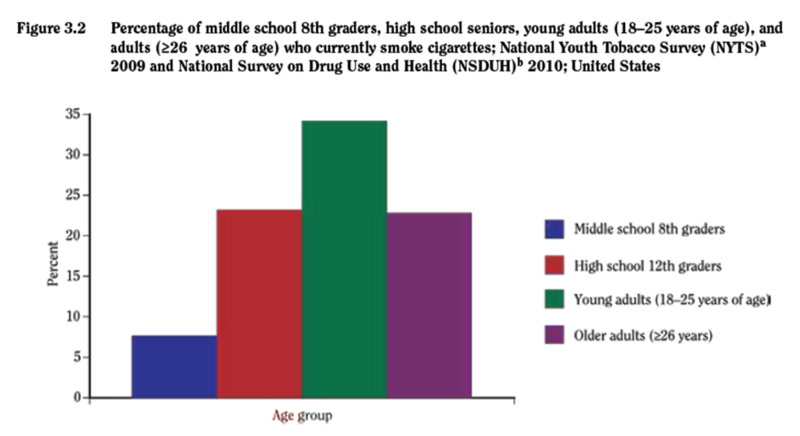 One startling fact: the high percentage of cigarette smokers starting even in middle school! 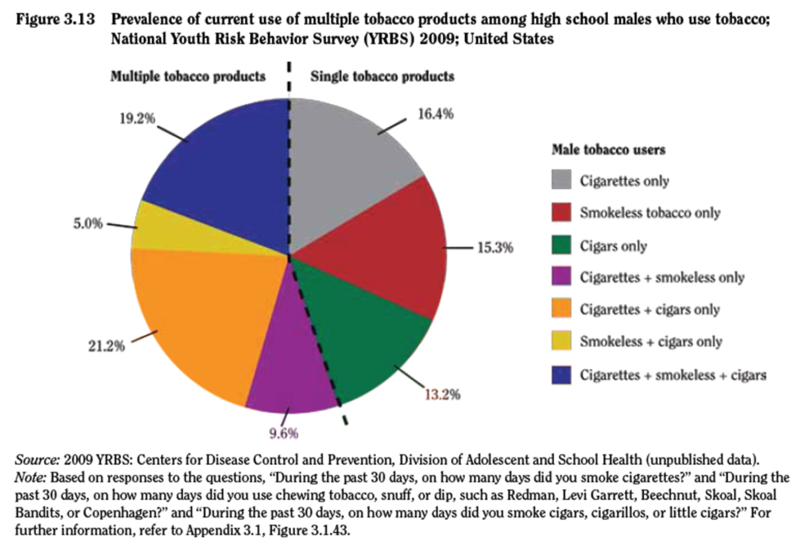 Starting tobacco use young—cigarettes, cigars, smokeless tobacco—has significant and sometimes unique health consequences outlined in this chapter. In this chapter, the various surveys and methods used for gathering data for this landmark report were discussed. Terrific for researchers, reporters and health professionals, the appendices provide the detailed data and tables that are such an important part of the study. For example one table showed the results of responses to use of multiple types of tobacco products expanding beyond just cigarettes to increasing use of chewing tobacco, snuff, cigars, cigarillos or little cigars. In this chapter, the researchers explore the factors that influence tobacco use among youth—and why they have such devastating long-term effects. Twelve years after the Federal Government’s Master Settlement Agreement against the tobacco industry, it is exerting as much influence as ever, with sophisticated marketing efforts aimed at increasing tobacco use. This chapter also outlines the ineffectiveness of the anti-tobacco programs the tobacco industry was required to do as part of the Agreement. This important chapter reviews the efforts to date to prevent tobacco use and what’s working and not. Finally, it concludes with a vision from the research team on how communities, schools, parents and the public health programs can help end tobacco use. In 2008, tobacco companies spent 48% more on cigarette marketing (totaling $9.94 billion) and 277% more on smokeless tobacco advertising (totaling $547 million) than in 1998, the year of the Federal Government’s Master Settlement Agreement against the tobacco industry. For every person who dies due to smoking—more than 1,200 each day—at least two youth or young adults become regular smokers. Almost one in four high school seniors is a current (in the past 30 days) cigarette smoker, compared with one in three young adults and one in five adults. Among those who use tobacco, nearly one-third of high school females and more than one-half of high school males report using more than one tobacco product in the last 30 days. Key influences include peer pressure, genetic predisposition toward addiction; family socioeconomic factors and educational attainment; sophisticated package and advertising design aimed toward kids, and depictions in popular media, particularly movies. Smoking won’t help you lose weight, contrary to young people’s beliefs. Adolescent smoking contributes to earlier onset of health problems, from asthma to cancer to heart and lung disease. CDC: Finally, for more information and additional resources on preventing tobacco use among young people, go to www.cdc.gov/tobacco. If you smoke and want to quit smoking, cal l 1-800-QUIT NOW (784-8669). American Cancer Society: Stay Away from Tobacco resources. 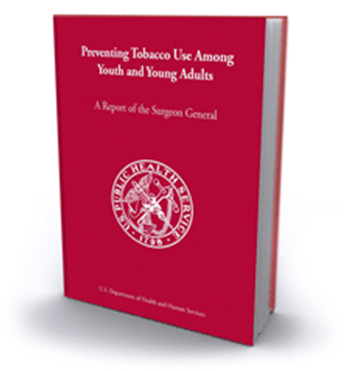 HOW DO I OBTAIN “Preventing Tobacco Use Among Youth and Young Adults: A Report of the Surgeon General”? Find this and other books about Alcoholism, Smoking & Substance Abuse on our new online bookstore. This entry was posted on Thursday, November 15th, 2012 at 4:46 pm and is filed under Centers for Disease Control and Prevention (CDC), Department of Health & Human Services. You can follow any responses to this entry through the RSS 2.0 feed. You can leave a response, or trackback from your own site. Smoking is injurious to health so this site is very useful to collect useful information about our health ! i am highly thankful for the author of this site ! Smoking is injurious to health,keeping this in mind this site is worth to read,i read this site regularly to motivate myself,thanks. This is just fantastic – I just hope the message reaches enough teens to make a real difference. Ah, a cuppa joe with Uncle Sam… What could be better? 😉 Thanks for writing! Smoking should be forbidden for everyone. Kids take up smoking to be cool, to impress their friends with their recklessness and defiance of adults so help your kids build up self-esteem, self-confidence and resilience to prevent them from smoking. The artist have motto : imagination, creation and satisfaction. They need stimulus to reach them,but not all of the artists are smokers..!